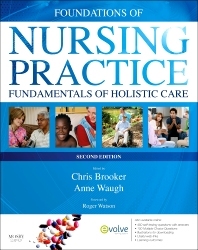 This second edition of Foundations of Nursing Practice has been revised and updated specifically to meet the needs of nursing students in all fields of practice The book explains how and why sensitive, safe, evidence-based holistic nursing care is carried out, including topics common to all fields of practice. Core nursing skills are emphasised to reflect the importance of clinical skills as well as the underpinning theory. Useful websites, references and further reading. This book provides a comprehensive introduction to nursing that will meet the needs of students, nurses returning to practice, mentors and other registered nurses. Evidence-based practice is explicit throughout, and best-practice guidelines underpin exploration/explanation of nursing care. Easy-reference Glossary at the back of the book.